Children also receive extra special "For Kids Only" attention at SCSC. We take the time to build their trust and put them at ease. Children are given a ride to the operating room in a little red wagon. And unlike a hospital setting, parents are permitted to remain by their child’s side up to and right after their procedure. Patient safety is always a top priority. We hope your experience will exceed your expectations –as it has for so many of our patients. This is reflected in our patient satisfaction score, ongoing patient satisfaction surveys indicate that a remarkable 99% of patients would return to SCSC if they were to ever need surgery again. 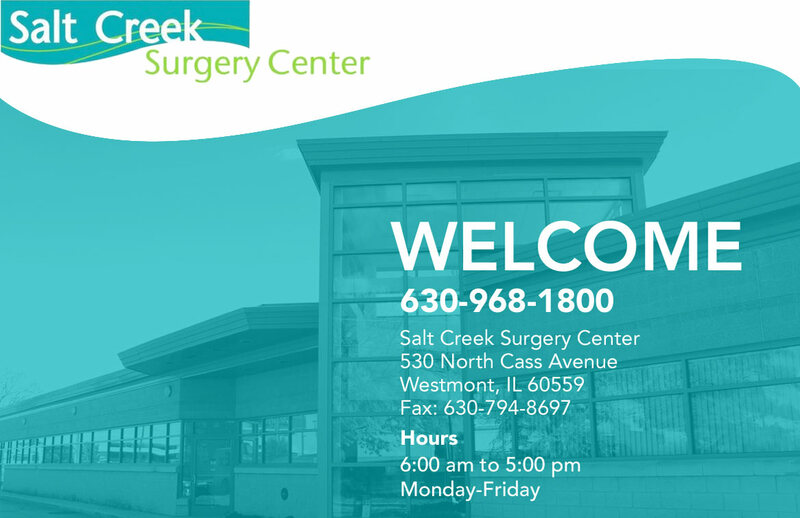 Thank you for choosing Salt Creek Surgery Center. Salt Creek Surgery Center is accredited by the Joint Commission on Accreditation of Healthcare Organization; licensed by the Illinois Department of Public Health, and certified by Centers for Medicare and Medicaid Service (CMS). Our medical staff is comprised of 60 surgeons, physicians, and podiatrists. The center specializes in orthopaedics, podiatry and pain management. Anesthesia services are provided by a group of anesthesiologists working as independent contractors. The center is licensed by the Illinois Department of Public Health, accredited by the Joint Commission on Accreditation of Healthcare Organizations, and is a provider in the Medicare Program. Salt Creek Surgery Center is managed by Hinsdale Orthopaedic Associates, S.C. The surgery center is owned by Hinsdale Orthopaedic Associates, S.C. and Edward Health Ventures. You may ask your physician/surgeon or the center administrator for further details. No need for lengthy hospital stays for hip and knee replacements. With outpatient joint replacement, patients are allowed to go home the same day. Patients can recover at home, instead of overnight in a hospital. With minimally invasive techniques, modern pain protocols, improved anesthetic techniques and rapid rehabilitation protocols, Hinsdale Orthopaedics surgeons are able to perform joint replacement procedures on an outpatient basis.